Thread galling is a common concern with stainless steel fittings. When two surfaces come into contact with each other there can be adhesion which can cause a tearing of the metal on the thread. This is referred to as thread galling. Galling will cause threads to not seat properly which will cause the fitting to not seal properly and ultimately fail. While thread galling can occur when proper installation and use is followed the problem is easily preventable. Thread galling will not occur with SAE, UNC straight threads or BSPP (British Parallel Port). OmegaOne stocks both flare fittings (TX) and flareless (F) which are straight threads. BSPP fittings are available as a non-standard. 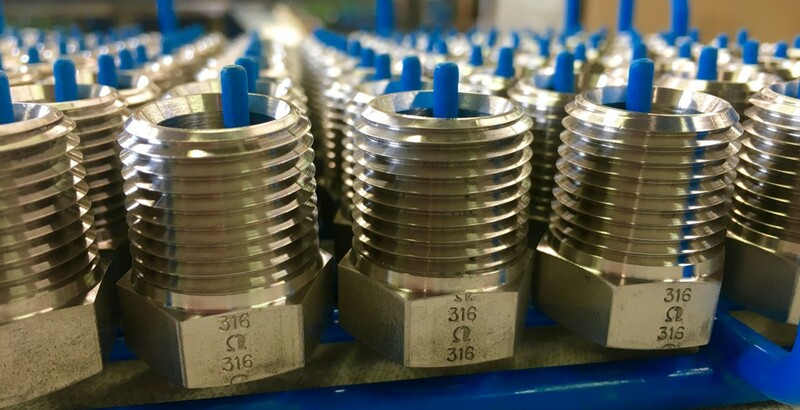 OmegaOne flare fittings (TX) follow torque SAE specifications and will not gall unless the torque specification is exceeded. Flareless (F Series) nuts are manufactured with a Moly-Coating to lubricate the threads preventing thread galling. Both male and female thread ports do not experience galling. Those thread ends are designated in OmegaOne part numbers with a G at the end of the part number. The following all designate straight thread ends available on TX and F series fittings: GC LGC GE GBT GRT The ends listed above are SAE straight thread male fittings with an O-ring which facilitates the fitting seal. Lubrication is not recommended. Pipe fittings, both NPT and NPTF can very easily call. BSPT (British Taper Thread) can also easily gall. The same care given NPT/F threads should be taken for BSPT. OmegaOne manufacturers many fittings with pipe threads. Our P series fittings are all manufactured to the NPTF standard. OmegaOne Flare fittings (TX) and Flareless fittings (F) are made with mating ends that are NPTF. The chart below indicates which OmegaOne fittings that have threads which do or do not require lubrication to prevent thread galling.